B"H 10 motorcycles have been ordered and will soon be on the road, with professional Nanach paint job and speakers, a new arm in Nanach hafatza. Special credit to Aron Patz and Nir Shpitzer, may H"Y bless them and help them do more hafatza. 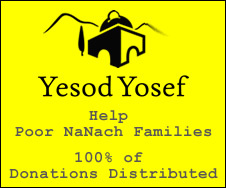 They are also credited with the recent publication of 40,000 Nanach pamphlets, most of which have already been distributed, and B"H this is just a drop in the ocean to what is expected.